The choir will perform a mixed programme of glorious choral classics and more recent compositions which are all linked with the church. 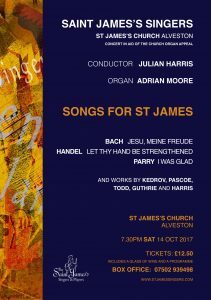 The centre pieces of the concert are Bach’s most popular motet, Jesu Meine Freude and Handel’s delightful Coronation Anthem, Let Thy Hand be Strengthened. The programme will include works from the Renaissance to the 21st century – a veritable ‘box of delights’ with something to please all tastes. 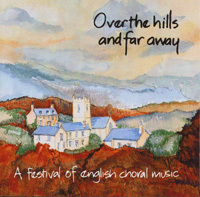 Other works to be performed include Parry’s majestic anthem, I was glad, and the joyous Cantate Domino by Monteverdi. These will be balanced by atmospheric settings of the Pater Noster – by the Russian Kedrov and by Julian Harris who was organist at the church for many years. Julian’s Pater Noster is taken from his Trelowarren Mass which was written for use in Saint James’s. 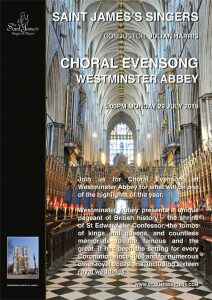 There will be four other pieces with a direct connection to Alveston – written by people with a close association with the church, including the hauntingly beautiful The Call of Wisdom which was commissioned by St Paul’s Cathedral to celebrate the Diamond Jubilee of HM The Queen.